A new Megadrive game in 2018? …Oh, you’re not pulling my leg? Well then, let’s check it out. 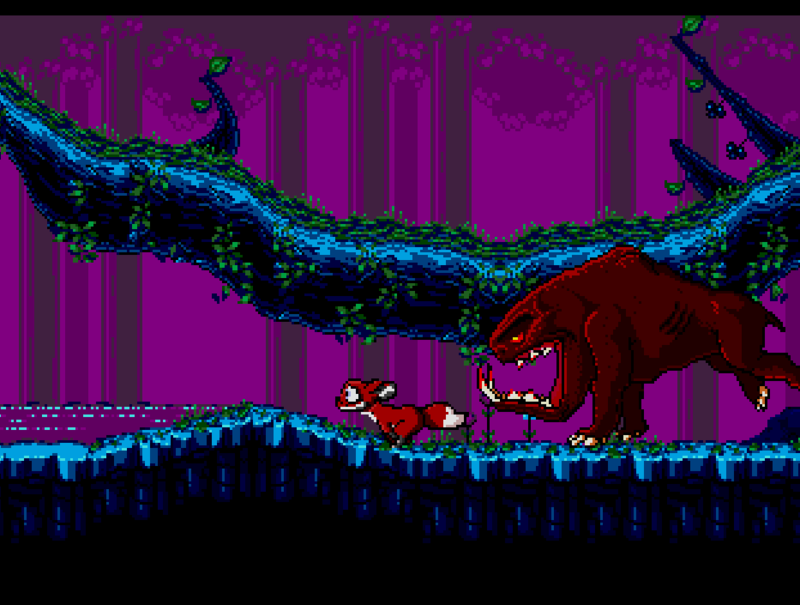 Tanglewood is a brand-new Mega-Drive game, by Matt Phillips of UK indie studio Big Evil Corporation, coming off the back of a successful Kickstarter campaign. Now, being a new Mega-Drive game in 2018 is cool enough, but the fact that this game was made on an original 1990s Sega dev kit in full assembly language is even cooler. This gives it an authentic 90s feel. 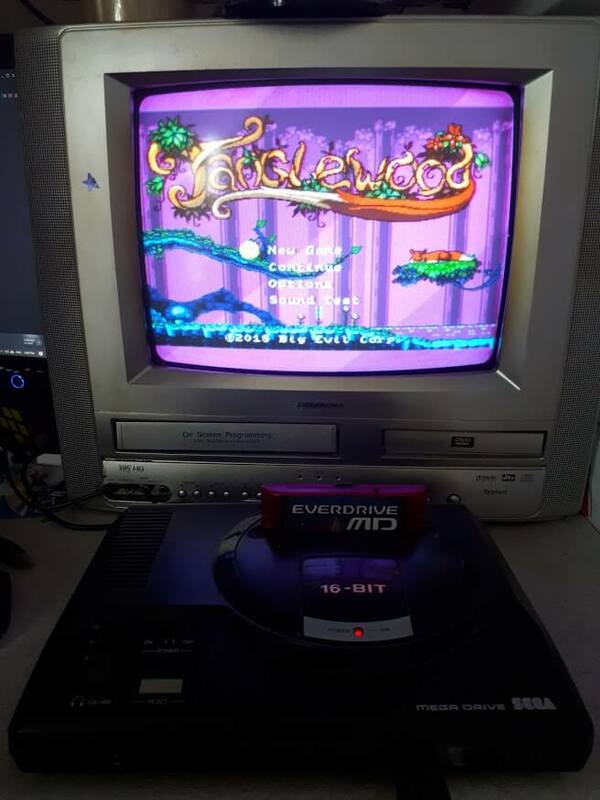 Tanglewood is available on Windows, Mac or Linux machines, but it also contains a Mega-Drive/Genesis ROM file so you can load the game up in your emulator of choice and play it there. Maybe even load it up on a flash cart if you are so inclined. But that’s not all. The company is also selling Tanglewood on an actual region-free Mega-Drive cartridge, which is absolutely marvellous — and I believe it’s the first game to do such a thing since Peir Solar. So, enough about me gushing over the fact that a new Mega-Drive game launching in 2018 is the coolest thing that could happen; let’s actually talk about the game. And just FYI, I was playing Tanglewood mostly on real hardware, on a CRT, as I felt that was the most authentic way (as such, screenshots are from the press kit). Tanglewood, at its heart, is a love letter to to the 16-bit platformers of the day, with shades of Sonic and Lion King about it. You play as Nymn who, while not explicitly described, seems to be a fox, separated from the rest of their pack. Your quest is to survive the dangerous night and make it until morning. 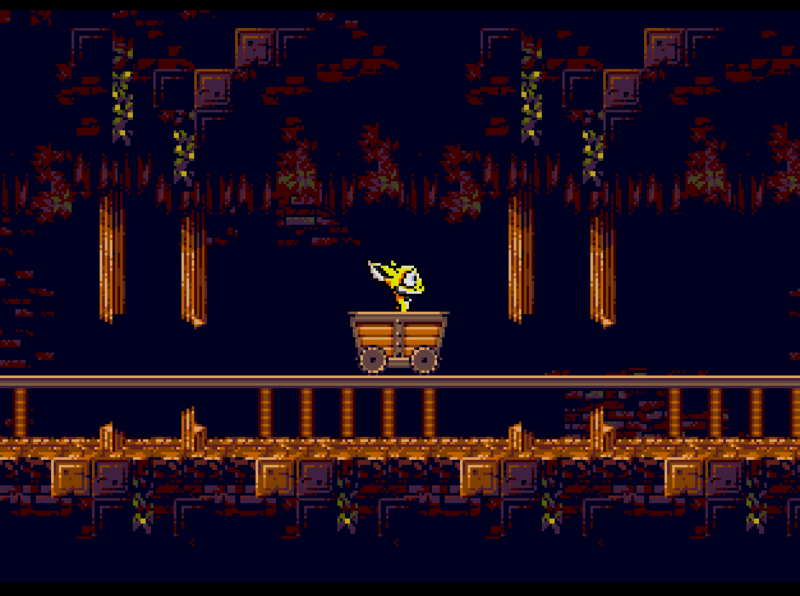 Every level pretty much follows this format, really showing off the rather nice palette changes. The Nymn sprite looks so wonderfully perturbed. Visually, it’s grand. The night brings with it some nasty creatures, as you would expect, and with them comes their single-hit kills. So they are best avoided. However, the one-hit kills, a staple of old games, is balanced by you having infinite lives and dense checkpoint distribution. There is also no HUD, which is odd for a game of the period, but there are certain stats shown in the pause screen. Enemies, as mentioned, will often only appear after the sun has started to go down. Some seem friendly, like the Scirus, a squirrel which will quickly turn on you if cornered. Others are immediately hostile, like the Djakk, who will smell you out from a distance and chase you down. It is faster than you, so you will have to keep your wits about you to avoid it — that or drop a boulder on its head. Nymn controls quite simply at first, with just a simple run-and-jump mechanic. The character starts on their back legs and moves to all four as they speed up. They also jump with a satisfying, Sonic-like spin. You can also push and pull certain things such as rocks, boulders and boxes. This leads onto the next major mechanic: Fuzzls. These are fuzzy little ball-type creatures you have to rescue and return to their nests. When you do, new abilities can be yours — abilities such as gliding, slowing time and taming the various beasts. That last one eluded me for a while and saw me stuck in front of a large jump. The ROM version of Tanglewood did not have an in-game manual, so I simply could not figure it out initially. The Fuzzls can be used to power machinery in later levels, for various effects, and there are also fireflies strewn around each level. These have no effect and are just a nice collectable. 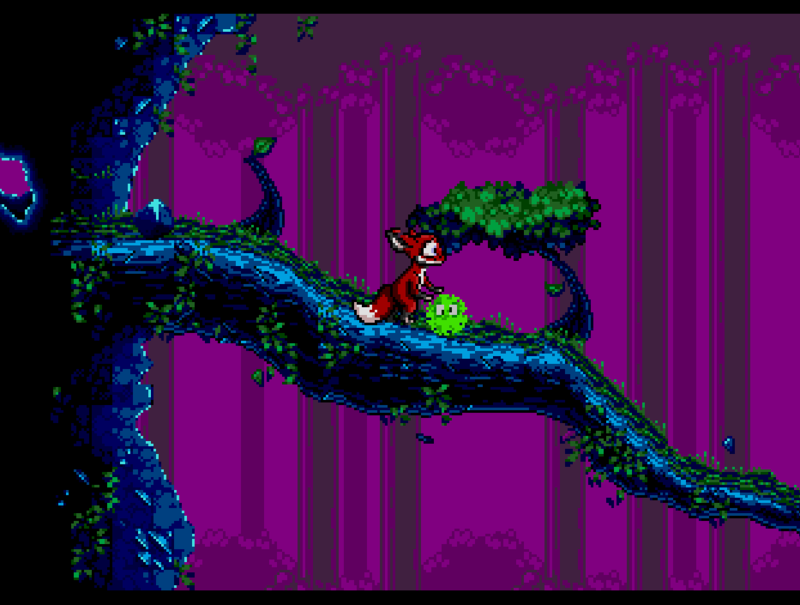 Tanglewood’s level variety is brilliant, with a lot of new mechanics and challenges introduced as you progress. Your journey starts out in a forest with just your basic platformer fare, while later levels introduce gusts of wind that affects gliding, There is also machinery, and even minecarts. All of this is rendered in a fantastic style, in multiple palettes which actually fade between each other to illustrate the passing time. 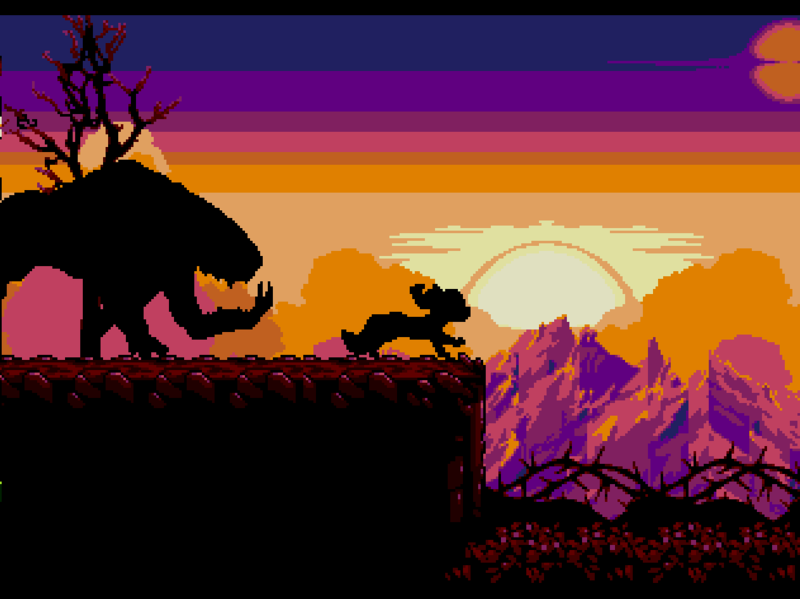 On certain levels, this will actually cause the player and enemy sprite to become silhouettes in the foreground on a beautiful purple-and-gold backdrop. Saving, at least on the Mega-Drive version, is also handled in a traditional way — a code system. Once again, this is something shown on the pause screen and codes can be entered again at the title screen to let you continue your adventure from the level you left off. In short, this is a wonderful look at how games used to be developed, and a wonderful game to boot. While some of the powers were not entirely intuitive, part of that is my own fault for not looking at the manual — which explains everything perfectly. The fact that there even is a manual (on-screen for the PC version, but set out like a Mega-Drive booklet) in the first place is just one more way that the developer, Matt, was showing love towards the games of days long gone. There is a demo version of the Mega-Drive ROM that anyone can play right now, and I highly recommend you do. If you really love Tanglewood, and have the hardware, go ahead, get that real cart and support this game in every way you can. A grumpy old git with a taste for all things retro, and will be behind Nintendo till the day he dies. 5% Human, 95% Hair, all Gamer.